The latest version of Samsung’s Galaxy smartphone could have a three-sided display, rumours suggest. The new smartphone, which is tipped to launch next year, might sport a wrap-around display so that content on the curved screen can be read from extreme angles. 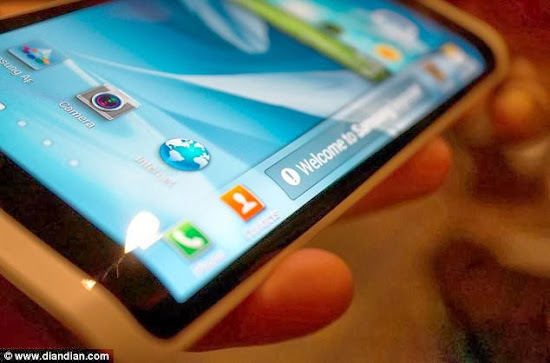 The display is likely to feature on Samsung’s Galaxy S or Note luxury handsets, but it could even be the first of a new line of curvier handsets, accaThe latest version of Samsung’s Galaxy smartphone could have a three-sided display, rumours suggest. The new smartphone, which is tipped to launch next year, might sport a wrap-around display so that content on the curved screen can be read from extreme angles. The display is likely to feature on Samsung’s Galaxy S or Note luxury handsets, but it could even be the first of a new line of curvier handsets, according to the rumours. Sources close to the company told Bloomberg the phone will use an enhanced version of the company’s Youm technology. Youm is used in Samsung’s Galaxy Round handset, which was released last month. However there is currently no release date for the next generation device, although it is likely to be launched in the second half of 2014, the sources said. The sources believe each side of the display could operate independently, which could make for a radical new experience for a smartphone user. Samsung sells around one in three luxury handset and is locked in competition with Apple to showcase the latest technologies in its smartphones. Apple is believed to be developing iPhones with larger screens, enhanced sensors for greater touchscreen accuracy and curved displays, putting pressure on Samsung to also be innovative with the designs of its next handsets. Samsung has already shown off curved screens at the Consumer Electronics Show in January and has used a flexible display for its Galaxy Gear smartwatch, as well as in a design for spectacles similar to Google Glass, that will be able to answer calls. Samsung filed a U.S. trademark application for Youm last year and has said the technology could be used in next generation computers and televisions, as well as Christmas lights. Lee Do Hoon, an analyst at CIMB Group Holding Bhd, in South Korea, said Samsung has a competitive advantage over Apple in the race to launch smartphones with flexible screens.